Charles Darwin’s 1859 revolutionary work, Origin of Species, proposed a theory of evolution based on mutation and natural selection. But neither Darwin nor his contemporaries could explain how favorable traits were inherited. Gregor Mendel, an obscure Augustinian monk who taught gymnasium (high school) science, working on the grounds of a monastery in Brno (now in the Czech Republic), provided the answer and the foundation for the science of genetics. Mendel was very familiar with Darwin’s Origin, and his personal copy of the German translation was heavily annotated. Less clear is whether Darwin ever read or was acquainted with Mendel’s paper, although he, too, was interested in variation and breeding in peas. Mendel’s paper was highly mathematical in presentation, which would not have attracted Darwin’s interest. Moreover, although Darwin could read German, it was arduous for him to do so. Had Darwin read Mendel, it would have undoubtedly provided him with insights as to how the benefits of natural selection were transmitted to subsequent generations. Sadly, Darwin and the rest of the scientific world remained oblivious to Mendel’s paper until 1900, when it was rediscovered. SEE ALSO: Lamarckian Inheritance (1809), Darwin’s Theory of Natural Selection (1859), Meiosis (1876), Genetics Rediscovered (1900), Hardy-Weinberg Equilibrium (1908), Genes on Chromosomes (1910), Evolutionary Genetics (1937), The Double Helix (1953). 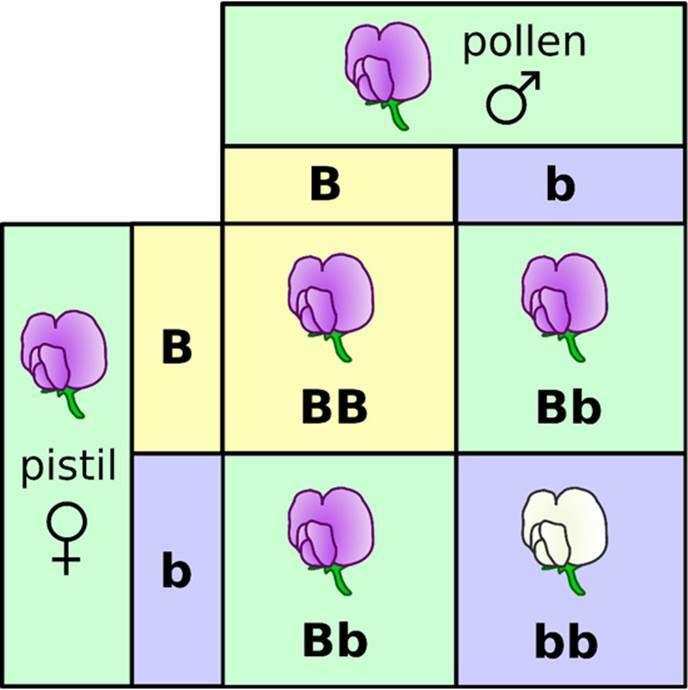 Developed in 1905 by the English mathematician-geneticist Reginald C. Punnett (1875–1967), Punnett squares predict the appearance of offspring after mating plants (here, Mendel’s flowers) or animals, and they are used by biologists to determine the probability that an offspring will have a particular trait.